At this time every year Apple promotes key products and accessories across its range, and in 2017 has led with a strong outdoor focus. 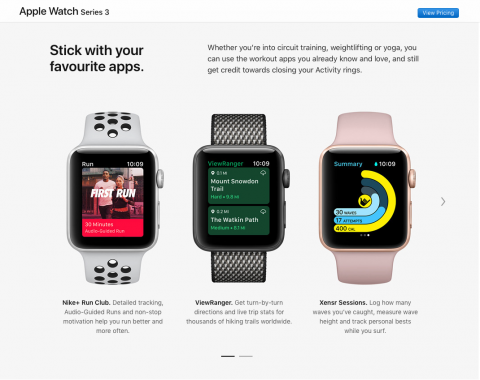 ViewRanger has been given star billing in the promotion of the new Apple Watch Series 3, with one of ViewRanger's route guides from the USA’s Pacific Crest Trail prominently displayed alongside Apple’s own Activity app. 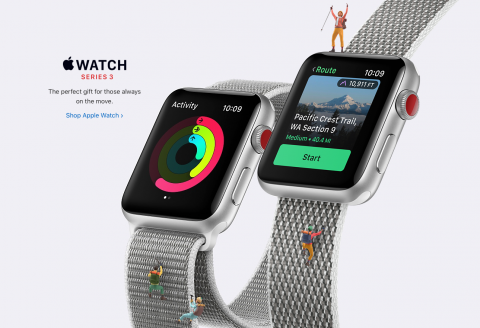 Describing the Series 3 as ‘the perfect gift for those always on the move’, Apple have also included miniature hikers and climbers in the image, reinforcing their belief that the outdoor market is a key area of focus for one of the world’s largest tech companies. For ViewRanger, this is a further endorsement of the strong relationship we’ve built with Apple in recent years. After giving a live demo of our app at their Keynote event in San Francisco last year, we’ve now been featured globally in over 130 countries on Apple.com, and in all of Apple's Holiday promotion materials. Learn more about our new Apple Watch app here.